Objective: Students will use a color palette consisting of cool colors in monochromatic tones to create a winter scene. Introduce students to the concept of monochromatic painting, in which artists use a limited color palette (such as black, white, and one color) to create a unique mood in paintings. 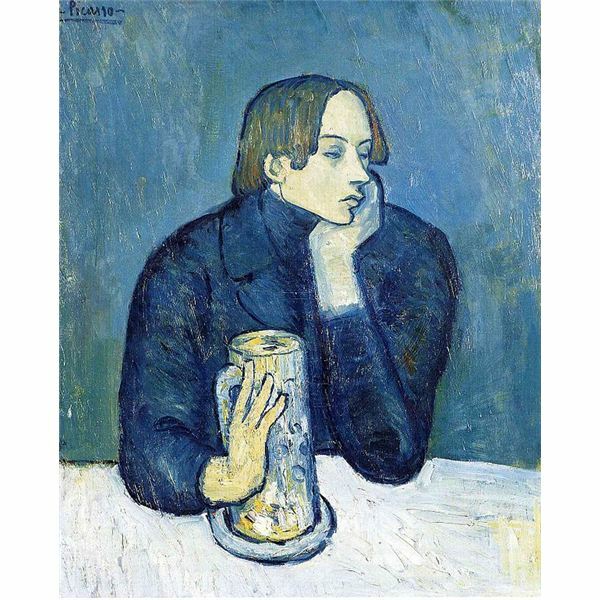 You may want to share some samples of works from Picasso’s blue period to show the idea of limiting the color palette in paintings and the effect of the color blue on the mood of the work. Share a color wheel with the students, noting the “cool" side of the color wheel (blue, blue-violet, and blue-green), and discuss how those colors might contribute to the mood of a winter scene in art. Have students discuss their thoughts on using cool colors and share what subjects they might paint to show a winter scene in monochromatic tones. Briefly demonstrate a basic sketch of a winter scene, and use a limited color palette to sketch in values (lights, darks, and middle values). Explain to students the importance of emphasizing lights and darks for contrast, since they will not be using complementary colors for this activity. Have your students tape paper to their boards. Using their reference photos, ask them to begin by sketching out their compositions. After the initial sketches are complete, have your students shade in values, using light and dark tones of their chosen colors/medium and leaving the lightest lights white. Note: You may want to discourage use of black until the paintings are close to complete, and to use it only minimally at that stage. Too much black will end up competing with the chosen color for the monochromatic scheme. For the final step, ask students to continue blending and shading, deepening their darkest darks and using white or lifting out lightest lights as needed (depending on the medium). Students can sharpen any edges and add details to complete their pictures. Assessment: Ask students to post their completed paintings on the wall, and lead the class in a discussion of the advantages and disadvantages of using a limited color palette in art. Have students share their thoughts on how the use of cool colors affects the mood of the paintings, and if they felt that using cool tones in a monochromatic color scheme enhanced or detracted from the winter scene they were trying to paint. Extension: To take the monochromatic color scheme experiment further, students can repaint their winter scenes using a limited palette with a warm color, and note the changes in the mood of their paintings.